When Sigma Tau Delta was founded in the early part of the century, Case School of Applied Science was a young school, growing and trying to gain a reputation as a quality technical school. The fraternity system on campus began in 1884 when Zeta Psi was founded, and at the time of the Sigma Tau Delta founding in 1909, eight fraternities were active on the campus. The founders of the fraternity were A.J. Bohrer, Fred W. Fiehl, George K. Sauerwine, and F.K. Zeichman. The fraternity was incorporated by the state of Ohio in June of 1909. The date as to when the fraternity was actually formed is suspect because we know that Sigma Tau Delta existed as an underground fraternity for a while before 1909. According to alumnus Karl A. Eger '19, the founders started the fraternity during their sophomore year, which would make 1906 or 1907 the founding date. The fraternity waited, however, to officially announce itself until November of 1910 when it did so as a strong, functioning fraternity. The reasons for the creation of Sigma Tau Delta were based on what was happening elsewhere in the Case fraternity system of the early 1900's. The founders felt that the other fraternities had gained control of other student organizations and student government and were using the position they had gained through these offices to benefit themselves and not to benefit the campus as a whole. Sigma Tau Delta was founded in response to this lack of true fraternal objective. Sigma Tau Delta was to be a positive force on campus in general - to make campus life better through cooperation with the school. Even though Sigma Tau Delta was a local fraternity, it was able to compete with the national fraternities and became a strong component of the fraternity system and campus life. Case welcomed Sigma Tau Delta because of the prestige that fraternities brought to the school - a prestige for which Case hoped at the time. Because Case was still mainly a Cleveland school, most brothers were from the Cleveland area. This closeness within the community aided the fraternity in many ways. An active alumni association, ladies' auxiliary, and parents' club were possible because of the local background of chapter members and alumni. In 1910, the fraternity gained use of a house for the chapter and has ever since maintained its own home. In 1925, the Sigma Tau Delta Finance Corporation was founded and remained strong for many years. Its main function was to provide for the housing of the chapter. But because of the strength of the group and dedication of its members and officers, other areas of chapter life were aided such as scholarship and house renovation. It even acted as a loan agency for alumni members. Stock was sold in the corporation, and the funds derived served as the core capital for the group. It was a special point of pride to the finance corporation that it could help out alumni who were enduring hard times during the Depression by making loans to them. Despite the economic problems of the 30's, the finance corporation remained solvent and in 1935 bought a house for the chapter at 1719 East 115th Street. 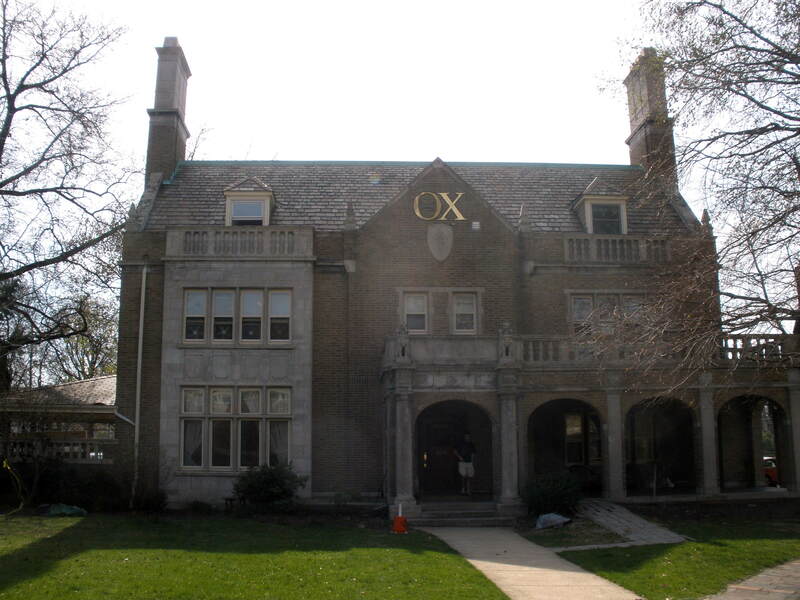 The group remained in control of chapter housing until 1971 when a Theta Chi Housing Fund was formed. Throughout our years as Sigma Tau Delta, the fraternity membership averaged 20-30, and about 200 men had been initiated into Sigma Tau Delta by the time of installation into Beta Kappa. Unfortunately, no Sigma Tau Delta rituals or documents of government were saved. With the growth of Case came growth of the fraternity system. By 1930, the system had grown to 12 chapters, including one other local fraternity. Sigma Tau Delta was beginning to change its outlook. In 1930/1931, the chapter had a "nationalization committee" and had looked at Phi Kappa, a Catholic fraternity, as well as Beta Kappa. A few early alumni have suggested that national fraternities had garnered such prestige on college campuses, including Case, that Sigma Tau Delta felt the need to become a national fraternity chapter to continue to compete on a comparable level with others on campus. In November 1931 Sigma Tau Delta presented a petition to Beta Kappa stating, "The theme of this petition is conservatism," which could be taken as an indication of the times. The petition statement itself expresses a desire "...to compete more keenly with the national fraternities at Case and likewise derive the individual benefits that come from affiliation with a strong national organization...." On December 29, 1931 the chapter became Alpha Nu of Beta Kappa. Xi Chapter from Allegheny College, which would later become a Theta Chi chapter as well, conducted the installation. Shown on the right is the Beta Kappa Coat of Arms. Partially because of the brevity of the period that the chapter was a part of Beta Kappa, not much is known. We do know, however, of a few outstanding achievements of the chapter during the 30's. As mentioned before, the Sigma Tau Delta Finance Corporation purchased a house for the chapter in 1935. This was significant in two ways; the first being that during the economic hardship of the 30's, the financial solvency still existed within the fraternity to make the purchase possible. This included the strength of the undergraduate chapter. Secondly, and more importantly from the fraternal standpoint, was that the ties between Sigma Tau Delta and Beta Kappa were still strong. In a 1932 letter sent to alumni, the idea of fraternity was expressed by stating that the purpose of the Sigma Tau Delta Association would be to promote the welfare of Beta Kappa by cultivating social relations among its members. This was again emphasized when the house was purchased in 1935. Also in 1935, the chapter hosted the national convention of Beta Kappa, called the National Conclave, here in Cleveland. At the time of this national gathering, it would only be seven years before Beta Kappa would merge with Theta Chi. Shown on the left is the Beta Kappa membership badge. By the early forties, Beta Kappa had grown to 47 chapters since its founding in 1901. But the depression had weakened the fraternity and the impending war only weakened it more. The leaders of Beta Kappa looked to merge with a strong national fraternity with similar beliefs and chose Theta Chi. Each Beta Kappa chapter was given the choice of whether to be installed as a Theta Chi chapter or go on as a local chapter. Seventeen chapters chose Theta Chi, including our chapter. On April 14, 1942 Beta Kappa and Theta Chi merged and on May 16 we were installed as Beta Nu Chapter of Theta Chi. At the time of our installation we had about 25 actives. The installation was performed under the direction of J. C. Stevens, Theta Chi's National Counselor and Installation Chairman. Initiation of members was performed by members of Alpha Tau and Beta Lambda chapters. Our chapter president at the time was Ed Kovachy, a true leader of the chapter who would be instrumental in obtaining a new chapter house. Case president William E. Wickenden gave the keynote address at the banquet. It was a time of renewal for the chapter, even though the war would drastically reduce the chapter size. In 1943, the chapter moved into a new home at 11240 Bellflower Road, which was formerly the Halle family mansion. The Halle's were a well known Cleveland family that owned a department store chain. It was a bold move to make such a purchase during the war, much like the boldness of buying a house during the depression. At the time of the purchase of the Halle mansion, the chapter still owned the house it occupied on East 115th. Before this house was sold, it was leased to the Navy for a short time for an on-campus training program for Reserve officers. When the war started to deplete college campuses, Beta Nu was also depleted over time. Vince Costanzo, who would be an active alumnus and financial adviser into the 1980's, was the first Beta Nu to enter World War II. Many others, including Brother Kovachy, entered the war. In 1944, the chapter was down to 17 with most members on Navy Reserve. By early 1945 only 10 actives were left and the house was being rented to boarders. Although the chapter never went inactive, it was not until the GI's had returned in 1946 that the chapter could fully function again. Our first post-war president was Brother Costanzo. The chapter was eager to be successful and was helped out by parents and alumni, who in 1948 remodeled the chapter house. The late 1940’s through the early 50’s were a prosperous time for Beta Nu and for fraternities in general. We know that the chapter hosted many large events during this time when fraternity events were the highlights of the campus social scene. Men in tuxedos and women in long gowns were common sights on the special nights. It was a time for the glamour of fraternity life. In 1952, the chapter hosted Corral. Case’s 75th anniversary in 1955 and Theta Chi’s 100th anniversary in 1956 marked a year of special significance and celebration. It was a time when events of campus life seemed more important than they do today. In the late 1950’s, the chapter’s most distinguished alumnus, Don Knuth , ’60, was active. While at Case he was named Outstanding Sophomore by Tau Beta Pi , won numerous awards for his academic work, and was one of the founding editors of Engineering and Science Review. The magazine won a national award as best technical magazine in its first year of publication in 1959. Brother Knuth has gone on to write definitive texts on computer science, has been widely published, has taught at Stanford, and has received the highest scientific award given by the United States Congress. With the 1960's came a new era for fraternities in general and for Case fraternities in particular. It was a troubled time. Part of the change was rooted in the anti-establishment sentiment of the 60's and part was rooted in the changing face of Case during this time. The era of prestige of fraternities and a good rapport with the school was fading. The changes at Case were first glimpsed in 1962 with an announcement about fraternity housing being built on south campus. Case required that all twelve fraternities sell their houses and give the school $60,000 to cover the cost of customizing a dormitory into a fraternity house. Through the Sigma Tau Delta Finance Corporation, the chapter house was sold to the school for $46,000 in 1968. A little over $41,000 was given back to the school toward a new south-side house. Since it was not the $60,000 in full, we were moved into a house at 1575 Mistletoe Drive until the time came to move south. 1968 was also the year in which Case and Western Reserve federated creating Case Western Reserve University, which seemed to create some added confusion at the time. According to alumnus Cedric Dilcizian '68, the federation was looked down upon by the students of Case. Case viewed itself as on the move - but Reserve wasn't. Also, the move by the chapter was viewed with mixed emotions. The chance of a better house was encouraging for the chapter which was struggling against the anti-fraternity feeling on campus. But the feelings ran deep for the Bellflower house after having lived there and owning it for 25 years. In 1971, under Brother Eger who had been a leader in the corporation and dedicated alumnus since the 1920's, the Sigma Tau Delta Finance Corporation was disbanded and all holdings were transferred to Theta Chi which had just formed the Theta Chi Housing Corporation, even though it would be years before the new corporation would be a guiding force. By 1972, our account with the school reached over $43,000 but the university abandoned plans to build anymore houses on south campus. So the temporary move to Mistletoe would last from 1968 until 1986. The early 70's were a rough time for Beta Nu. Anti-fraternity sentiment, an unsympathetic university which dealt unfairly at times with fraternities, and a division within the chapter all contributed to a weakening of the chapter that resulted in a probation within Theta Chi during a brief period in the mid 70's. But because of the dedication of a small group of alumni and actives, the chapter began to rebuild and from the late 70's on the chapter has only grown in strength and numbers and achievements. The 80's brought new goals. The house that the fraternity had resided in since 1968 was now home and the chapter sought a long term lease, if not purchase, of the property, but it was not to happen. The most recent move for the chapter really had its start in 1984. The university had promised a long-term lease on the Mistletoe house after a meeting between Theta Chi, CWRU, and our property manager, University Circle, Inc., on the relationship between these three groups. In late 1984, after months of silence, the university announced plans to tear down the Mistletoe house to make room for new athletic fields. Negotiations then began through the Theta Chi Housing Corporation, which had been gaining in strength and influence. Along the way, during the negotiations, the $43,000 still held by the university was reclaimed almost in full to pay for renovations to a newly leased chapter house. This was possible because of hard work done by actives which led to the recovery of the funds by the housing corporation. Because of the good standing the chapter held on campus, the strength of the brotherhood, and the work of the housing corporation, the chapter signed a long-term lease on a beautiful house on Magnolia Drive. As in 1968, the chapter had mixed feelings about leaving a house in which we had put so much of ourselves, but we knew it was for the good of the chapter. And so, the chapter moved into the new house in March of 1986. Our current chapter house at 11136 Magnolia Drive is displayed on the right.